Make your Christmas extra special this year; call all the Witches and Wizards with the special and spell binding Harry Potter ornaments. You can go for DIY ideas as well as gifting options to choose from featuring your favorite symbols, quotes and characters from the series. Harry Potter, a wizard who casted a spell on the entire world and enticed the young and old with his magic is back for Christmas. If you are a fan of Harry Potter’s magic then the décor ideas we bring here for you are surely going to attract and make you fall in love with it, especially the kids in the house are going to love them. Show off the pride of your house or highlight your favorite book/movie from the series with these DIY handmade ornaments which are made up from a mix of simple materials and beautiful packaging. CHRISTMAS ORNAMENT IDEAS FOR HARRY POTTER LOVERS. Winged Keys: Give your old keys some wings just like in the book and the movie making your old keys which are of no use find their purpose. Golden Snitch: Add paper wings to the golden snitch for effects by making your own with small balls from Christmas ornaments and hang them over the house. Dobby’s Socks: If you remember the scene where socks sets Dobby free, then design your Christmas stocking in a theme by drawing Dobby and Harry on them and cherish the memory. Harry Potter Book Covers: The mini book covers are made from Crayola Model Magic. To prepare these covers print the covers of Harry Potter books and cut them out. Take a large chunk of model magic, spread and flatten like a pan cake. Your model magic should be larger than the book cover. Press the paper book cover on the model magic. The clay will become sticky so that you don’t have to use glue but for some security, you can add dots of hot glue around the edges to hold the corners of the covers. Around the edges, cut off the excess model magic. To create a loop, cut 2 to 3 inches of string. Over the loop’s end press a small portion of model magic. Glue it for extra security. Repeat the process for all seven books. Decorate with Harry Potter books. Golden Snitch: Sparkly feathered Golden Snitches are so amazing that it will make your guests stay a little longer and appreciate the beauty of your house and get jealous at the same time. 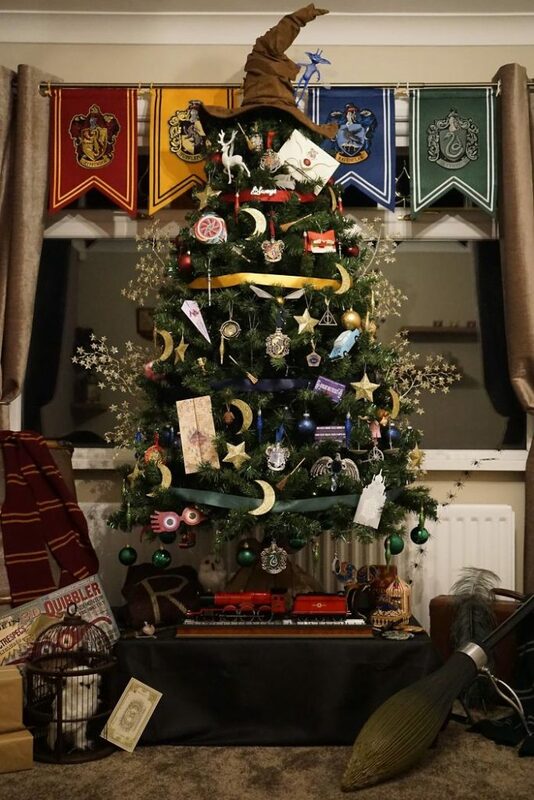 Think of holidays at Hogwarts and we envision epic décor, a big hall with snow sprinkling from the ceiling, massive Christmas tree beautifully dressed. To make the Golden Snitch décor follow these steps: Take feathers and cut its plastic tip close to the base of where the feather part actually begins. Put glue on feather’s tip. Press the end of the glue of the feather against one side of the gold ornament and hold the end until the glue dries. Repeat the same process on the other side of the ornament. Follow the same step to make more golden snitches. To make handmade snitches, first, on a scrap piece of paper, draw an actual size sketch of how you want your snitch wings to look. To shape thin craft wire in your wing shape use this sketch as a guide. To make a tight coil, close the shape by twisting the wire around the other one 3 or 4 times. Snip the wire close to the coil. Coat wires with glue and lay a sheet of tissue paper over the top of wires. With a clean, dry brush push down in the paper sticking it down to the wires all around each wing. Dry it and then cut out leaving few millimeters as a border. Apply glue to the border and roll over the edges of wire all around the wing. Coat the wings on each side with white glue and apply gold glitter and let it dry. To paint the swirly “snitchy” markings on the golden ornaments, you can use a mixture of gold and brown acrylic paint. Use a dab of hot glue on the wire coils to make a surface for attaching to the ball. You can hold them vertically against parchment paper as they do not stick to the parchment. To get the wings stick to the glass balls, try a bunch of glues. Hold each wing until the glue sets then cover the glue with gold paint. Finally, all set to décor the tree. Chocolate Frog Box: Get an empty chocolate box, to keep it closed, stick a loop of tape on top and on the back tape a loop of string and you are done with the simplest décor idea for the Harry Potter lovers. Sequined Deathly Hallows: Shape with Crayola Model Magic in a triangle and with the help of a glue gun affix a string of sequins in the shape of the symbol. Finally, at the back glue a loop of string to hang. Book Page Scrolls: Rip a page from an old used copy of Harry Potter book, roll it up and tie a string around it in a bow. Finally, hang it on the tree or tuck in a wreath. Painted Deathly Hallows: Simply paint the deathly Hallows on the metallic Christmas ball ornaments and let them dry before you hang them. Simply the Best. Fizzing Whizz bees: Take a box of Fizzing Whizz bees, cut the top of the box and tape the bottom together, loop a string through the top and tie in a bow for hanging. Hogwarts House Crest Balls: Print Hogwarts house crests and cut them out, roll up tape and stick to a Christmas ball ornament matching up the color of your house. Use a string to hang and you are good to go with an amazing décor. Deathly Hallows Sticker Ornaments: Take a deathly hallows sticker or you can draw the symbol on a paper and cut it, stick on a glitter cardstock and cut around the sticker. Leave a bit of glitter visible. On the back, tape a loop of string to hang. Harry Potter Glasses and Scar Ball: Draw Harry Potter’s round glasses and scar on the metallic ball ornament and hang it with a string. That is all you need to do to attract everyone’s attention. Chocolate Frog Cards: Punch a hole using a small hole puncher on the top of a chocolate frog card, loop a string through it and tie in a bow to hang. Harry Potter Sorting Hat Ornament: You decide whether you area Gryffindor, Ravenclaw, Hufflepuff or Slytherin with this customized piece of décor which can be personalized with the name of your choice. It is entirely made up of durable, lasting acrylic. You can hang it around the house on windows or any wall year around. Because of its light catching property, it can be hanged in the cars too. Harry Potter Accio Christmas Ornament: Created from earthernware clay kiln fired twice to over 1900 degrees. The handmade ceramic Christmas ornament reading “ACCIO CHRISTMAS” is a perfect gift and a décor option. DIY Liquid Potion Ornaments: You might find some Liquid Luck under the tree if you hang the Felix Felicis potion early enough. We all know that one of the coolest things about Harry Potter was the potions and spells and making those potions are too easy. To make potions at your home you will need: Plastic Globe Ornaments, Glitter Glue, Glitter, Warm Water, Food Coloring and hot Glue Gun. To make a poly juice potion, add warm water to the ornament and color it with green food coloring. Add small bottle of glitter glue (Green) to the warm water. Fill the ornament with more warm water. Cover the top of the ornament with a towel and shake until the glitter glue dissolves as you do with the other potions. Put the lid and set aside for later. To make Felix Felicis Potion, follow the same guidance as you did for Poly juice. Put the glue in the warm water so that it breaks down instantly. Once the ornament is filled with warm water, shake it again. To make a Veritaserum Potion which is color and odorless and not a fun ornament to make. To make it little glittery, use white glitter glue and extra glitter and rest follows as above. To make Amortentia Potion which is known for having a mother of pearl sheen is very shiny and shimmery. To make this potion, same set of instructions are to be followed without coloring the water with any extra coloring. Simply add a lot of extra white shimmery glitter to make the mother of pearl sheen. Now that, you have all your potions ready, it is now time for you print the labels. Make sure the potions do not leak. TIP: Make sure to cover all the holes in the lid before applying it to the ornament while you hot glue the lid. For safety, add a little more of hot glue around the edges. DIY Harry Potter Quidditch Broom Ornaments: You do remember the flying broom, don’t you? How about creating one here for the décor and have your kids’ imagination take a flight. The DIY project is easy if you have a belt sander and a Dremel. You will need some twigs, wire, metal foil tape and spriggy wreaths from the craft store for the broom bristles. To make these: From the twigs which you have, remove the bark using a belt sander and shape one end to a slightly angled point. This can also be done by hand with regular sand paper or a palm sander. Also, you can make your own twigs from clay. To attach the bristles around the other end of the twig, use hot glue, overlapping it by about an inch. Cut bands of metal foil tape and wrap the top edges of the bristles. Copper foil or a metallic curling ribbon secured with a dab of hot glue can also be used or you can use all three to have your brooms in Gold, Silver and Copper. Trim the broom bristles as per your liking, slightly tapering so the ones in the middle are longest. Drill a hole through the bristles and twig with a Dremel, thread wire through it and bend to form the foot rest. You can form it in a U shape or even keep them flat. You can also mix up the band styles with a double wrap or just one thick band. Though, the thick bands tend to crumple more, so, it is advisable to stick to skinny ones for a better and a realistic metal look. If you are not having a Dremel, wrap the wire. In fact, wrapping up the wire around several times can let you skip the metal foil tape all together. To hang the brooms, use a Dremel to drill a small hole through the twig right above the bristles’ edge. Thread a head pin through and bend the top of the pin in a loop. If you are not having a Dremel then glue on an O ring for a hanger or simply wrap more wire around the handle forming a loop. For your brooms, you can use a short wire hanger and hang them in the tip of your branches so that they can FLOAT. Flying Winged Key Themed Ornament: The classy handmade key chain made up of pewter key charm, wings, chain and loops are available in six different versions of flying keys. You can choose from: Jeweled Key which has a rhinestone placed throughout the key’s head measuring 2.75 inches long. Swirled key measuring 2.25 inches long. Oval Key measuring 2.25 inches long. The wings are double – sided and handmade of Angelina Fusible Film and Transparency Paper. Iridescent film brings shine to the wings making it look like a film on a bubble. Colorful and unique ornament décor idea which is shimmery and is having different colors depending on how you hold it at different angles. The keys are available on a blue ribbon to hang them on your Christmas tree to make it look a little more elegant and charming. Harry Potter Real Talking Sorting Hat: The real talking hat featuring animated mouth movement and authentic phrases gives you a unique experience sorting the ceremony from Hogwarts. The hat features four authentic phrases. Finally, here comes an end to our list of Harry Potter ornament ideas. Check them out or make them at your home and show off your DIY crafting skills and gather appraisals from friends and family. Do not forget to gift few of them your loved ones, especially kids and make their Christmas a little more special this year.